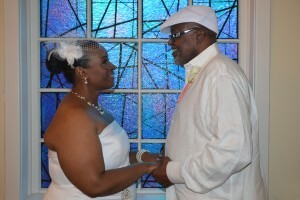 Niva Battles of Pine Bluff, Arkansas and Carl Brown of Oakland, California were united in marriage on March 5, 2016 in the chapel at Wedding Chapel by the Sea, Myrtle Beach, South Carolina. Rev. M. F. Anderson officiated. The bride is the daughter of Marion and Joseph Williams. The groom is the son of Patricia Odem and L.C. Brown. The Bride’s Maid of Honor was LaDonna Brown-White of San Diego, California. The Groom’s Best Man was Byron Jackson of Little Rock, Arkansas. After a honeymoon in Myrtle Beach, the couple will reside in Pine Bluff, Arkansas.